How is it almost Thanksgiving already? I swear, every year goes faster and faster. Feels like yesterday we were drinking Rose and enjoying 80 degrees days in the sunshine. But, I do love having all seasons where I live. Summer and Fall are my favorites. Thanksgiving is one of our favorite holidays in our home. Everyone loves coming to our house, I think it’s our cooking :) I’m always baking three to four pies the day before. Everyone has their favorites, the classic pumpkin, pecan, and apple. But I think this year I might mix it up and throw in a chocolate cream or?? 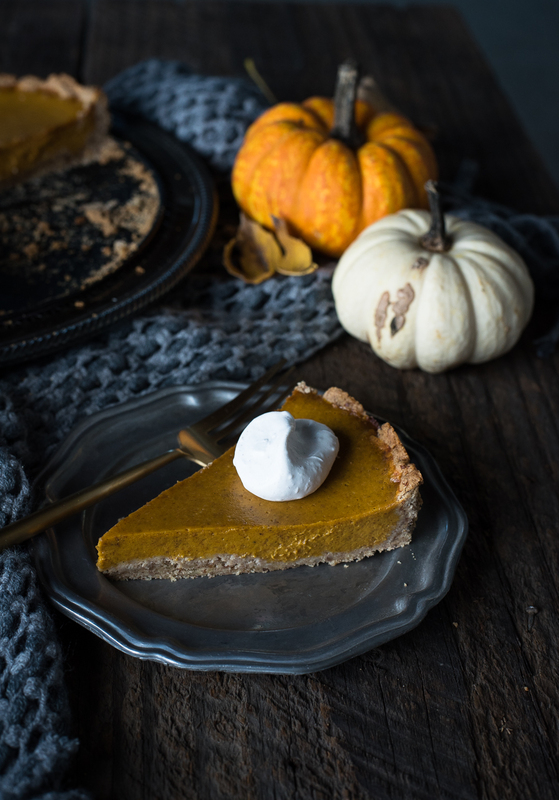 Last year I shared on my blog, my classic pumpkin pie and how to make your own puree. 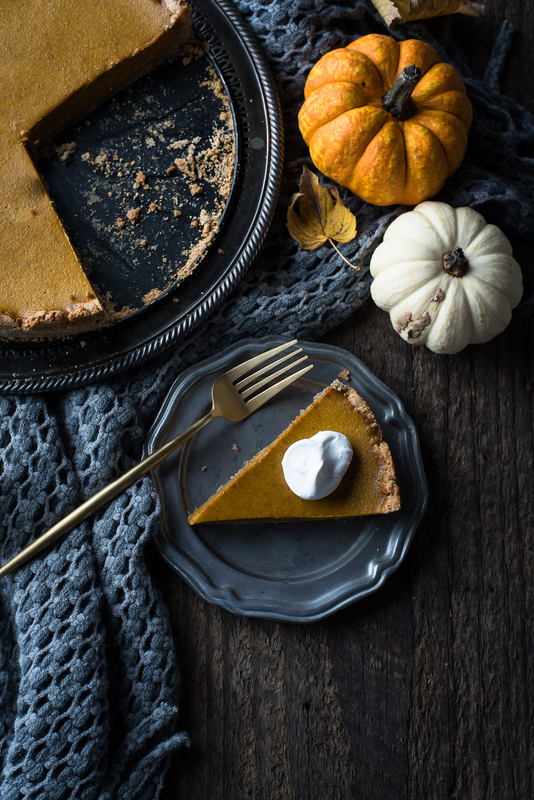 We grow pie pumpkins in our garden every year just for this holiday! This year, I tried something different. 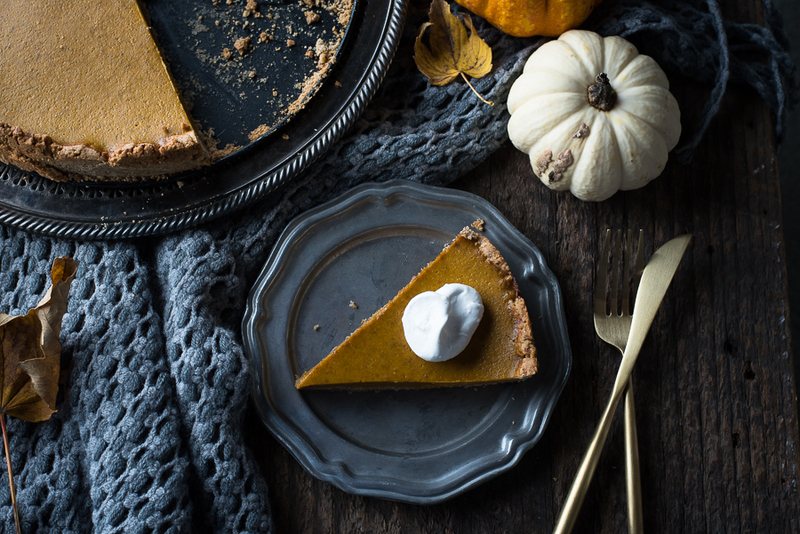 A pumpkin tart with a pecan crust. The pumpkin filling has greek yogurt, giving it a little tangy note along with spices. It baked up nice and firm, like a pie. The crust is pecans, butter, oat flour (which btw is gluten free!) some maple syrup and sea salt. It reminds me of a pecan shortbread, so good! Get yourself a 10 inch spring form pan with removable bottom, if you don’t already own one. You can use it for so many things like a quiche, cheesecake, mile high apple pie (one of my favs) or even a regular cake…. good investment. You could also use a tart pan, but mine is pretty shallow, and I wanted this tart to be thicker, like a pie. For the “whip cream” I used coconut cream and whipped it for a few minutes. For those of us that are dairy sensitive, this is a great option! It tastes yummy too! Make sure you plan ahead and have a can of coconut milk in the fridge. Scrape off that top thick part, and whip away! Hope you all have a lovely Thanksgiving wherever it may be, and eat lots of pie! 1 15 oz can organic pumpkin puree or make your own puree! Coat a 10 inch spring form or tart pan with olive oil spray. Pulse pecans in a food processor until finely ground. Add the rest of the crust ingredients and pulse just until combined. Transfer to pan, and press into the bottom and up the sides. Bake for 12-14 minutes until. Crust should not be very brown. Blend all filling ingredients in a food processor until mixed. Pour into warm crust and bake for 30 minutes. 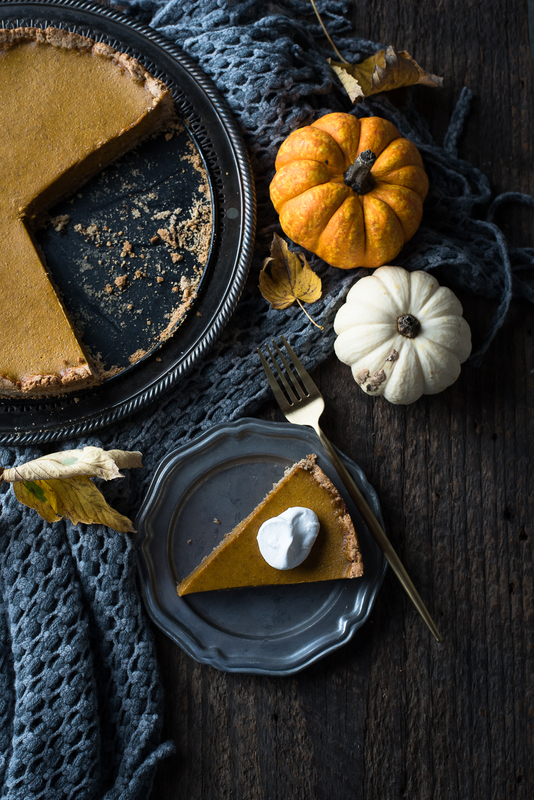 Filling will feel soft, but will continue to set as it cools, like a pumpkin pie. Let cool to room temperature, then place in the fridge for another 2-3 hours before removing from tart pan. Serve with whipping cream of choice! Makes about 10-12 slices.